Born to a poor grocer, Heinrich Schliemann (1822-1890) first heard Homer recited in the original Greek when he worked as grocer’s apprentice at the age of 14. During his lifetime, he became fluent in (according to varying accounts) eight to 13 languages, moving to Russia when he was 36 and dedicating his time and money there to studying prehistoric archaeology. His particular passion was the mystery of Troy and in his travels he sought to identify the site Homer had used for his epic The Iliad. Schliemann travelled throughout Greece, Italy, Scandinavia, Germany, Syria, India, China and Japan, and studied archaeology extensively in Paris. 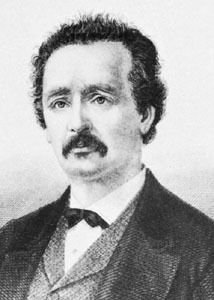 In 1868, Schliemann transferred his life and work to Greece, travelling to Homeric sites both in the archipelago and Asia Minor. In his 1869 work Ithaka, der Peloponnes und Troja (Ithaca, the Peloponnese and Troy), he posited that the Asia Minor site of Hisarlik was the site of Troy, rather than the previously considered site of Bunarbashi. Over the next few years, he excavated the site extensively and managed to prove his theory (also meeting along the way his second wife, Sophia Engastromenos). If Winckelmann was the father of Hellenic archaeology, Schliemann should be considered the father of prehistoric Hellenic archaeology. Although previous archaeologists had experimented with digs around the site of Hisarlik, Schliemann was the first to really look for Homeric Troy. Unfortunately, in his efforts to find the city (which he believed was at the lowest level of a man-made mound that previous archaeologist Frederick Calvert has excavated), he rather indiscriminately dug through the higher levels, possibly damaging materials in those layers. In 1875, he published his findings as Troja und seine Ruinen (Troy and Its Ruins). He followed up his excavations at Troy with a new effort at Mycenae, where he uncovered several tholoi (beehive tombs) as well as the famous Lion Gate. Inside the citadel’s walls, he found five shaft graves filled with 16 bodies and a large horde of gold, silver, bronze and ivory. He believed he had found the graves of Agamemnon and Klytemnestra (he famously claimed to have seen the face of Agamemnon in a grave for a fleeting moment), but later findings proved that they were not the graves of the Homeric characters. Schliemann returned to Hisarlik for two more excavations (his third from 1882-83 and his fourth was from 1888 to his death), where he was aided by Rudolf Virchow, a German pathologist, Emile Burnouf, an expert in classical archaeology, and later Wilhelm Dörpfeld, an architect who brought to excavations the innovative efficiency of German classical archaeologists working in Greece. Dörpfeld would help Schliemann uncover the Trojan strata and geology more clearly than he had before. Schliemann would excavate the citadel of Tiryns, near Mycenae, with Dörpfeld in 1884, just six years before his death. "Schliemann, Heinrich." Encyclopædia Britannica. 2007. Encyclopædia Britannica Online. 1 Dec. 2007 <http://www.britannica.com/eb/article-9066158>.